A well-developed and modern public transport network is an important location factor for any major city. PTV’s experts advised Hallesche Verkehrs-AG on the expansion and conversion of the tramway into a modern, sustainable light rail system. The task of PTV was to prove the eligibility for funding based on a standardised assessment. A positive cost-benefit ratio requires intensive and transparent liaising with the parties involved. PTV Transport Consult’s experts performed the economic calculations required. To meet future public transport demand, Hallesche Verkehrs-AG has initiated the Stadtbahn project together with Stadtwerke Halle and the City of Halle (Saale). Conversion of the tramway into a light rail system was started in 2013 and implemented in 3 stages. The project volume in total, across all 3 stages, amounted to EUR 300 million. PTV Transport Consult has supported HAVAG from the start of the light rail project. The company’s consultants performed the economic calculations and did the pre-planning investigations, the results of which have been included in the overall concept. A modern infrastructure ensures reliable and punctual operation and increases profitability. Public transport becomes more attractive due to higher travel speeds and shorter travel times. This gives public transport a time advantage over motorised private transport in particular. Passenger comfort is increased, e.g. through barrier-free stops with a high-quality waiting environment. Special track sections also ensure that the vehicles drive more smoothly. The new light rail system contributes to air pollution control and road safety. If more people opt for public transport instead of for cars, this will reduce the volume of motorised private transport. Fewer cars mean less negative traffic impacts, less CO2 emissions and other air pollutants, as well as fewer road accidents. 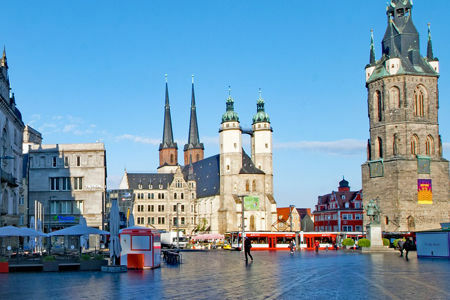 Attractive local public transport is a decisive location factor for the city of Halle (Saale). Good accessibility within the city and connections to the regional and supraregional public transport systems are important contributing factors to a positive customer perception beyond the city borders. The numerous advantages of the Stadtbahn Halle constitute benefits for the community from an economic perspective. These benefits can be quantified in concrete terms in the original units examined, such as the number of passengers and cars, the number of public transport vehicles or tonnes of CO2. They are then converted into monetary units and combined during the standardised assessment. Costs associated with the investment in the new infrastructure and benefits are compared. They are used to calculate interest payments and the necessary expenses for maintenance and operation of the expanded infrastructure. Reinvestments into the existing infrastructure can then be avoided. Calculations of economic costs and benefits are based on these parameters. Proof of a positive cost-benefit ratio was the prerequisite for project funding by the Federal Government and the State of Saxony-Anhalt. Liaising closely with all parties concerned was necessary to create transparency of the calculation guidelines, data bases and methodical approaches used. The light rail project has been implemented in three stages. Individual actions along the lines were combined for each stage. Special attention is given to the installation of a special railway body. The latter allows the tram to reach high travel speeds without being hindered by road traffic, as is required for a light rail system. The special track was another important criterion for standardized evaluation and for funding. Funding eligibility has already been established for stages 1 and 2. Currently, calculations are being carried out for the 3rd stage of the Stadtbahn Halle project. The third stage includes actions along the route of lines 3 and 8 as well as actions that supplement the network and thus contribute to optimising the overall system.